Whether you come for the high-speed racing, or just the lights, Drone Racing League has new drones ready for you to see. The Racer3 is the new machine for the second season of the sport, and it promises an entertaining season. 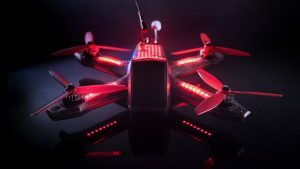 Drone Racing League will fire up in June, millions of dollars are on the line and you’ll be able to follow through a handful of sports channels on your TV, including ESPN. 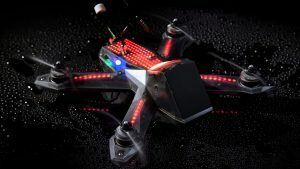 Unlike your local race track, where each pilot has their own custom built racing drone, Drone Racing League provides the same quadcopter to each racer. With the same machine in hand, the contest comes down to piloting skills, and let me tell you, you need some serious skill to handle this class of drone, never mind to complete a lap without crashing. As you can imagine, the league needs a few quads at the ready to make it through a season, we understand they’ll start with about 450 and build more as needed. It’s pretty much a sure bet that you’ll see some smashed drones each race, we’ll have to see how well the carbon fiber frames hold up. Summarizing the Racer3 spec sheet, we’re about to witness 85 mph drones, and they’ll go from 0 to 80 in about a second. A diffused polycarbonate shell protects the important bits, over 200 LEDs with RGB color adorn each drone, for easy tracking and pilot identification. They weigh about 900 grams, so about two pounds, and are propelled by 6-inch tri-blade propellers. 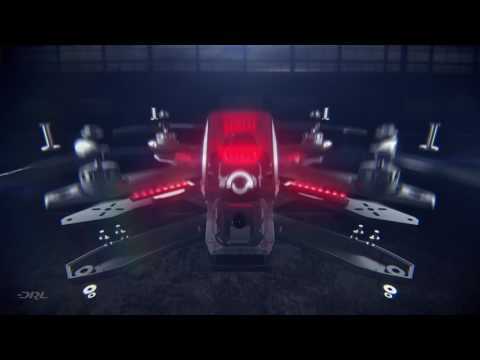 If I still have your attention, but you are not sure what this Drone Racing League is all about, watch the video below, then join us in being excited for June.